Ableton Live 9 Suite Review – Best DAW for Guitarists? Ableton Live is a digital audio workstation (or DAW) and software music sequencer for Mac OS X & PC that lets you create, produce, and perform music. While most DAWs are used primarily for recording, sequencing, mixing, and mastering music, Ableton Live differs in that it can also be used as a live performance instrument. 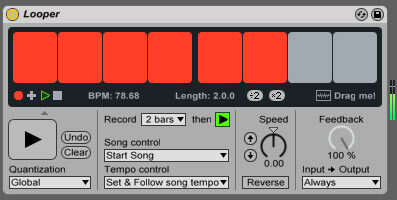 Ableton Live also offers possibilities for realtime looping, MIDI control of your guitar effects pedals, and much more. It was nearly 10 years ago that I first discovered Ableton Live. With home computers becoming increasingly powerful and quality audio interfaces becoming more affordable, it seemed that the only thing separating me from recording music at home was finding the right recording software. In my extensive research there was one digital audio workstation (DAW) that stood out above the rest. It was Ableton Live, already at version 5 at the time. While other DAWs seemed comparable in terms of allowing convenient home studio recording, Ableton Live promised some interesting possibilities for using the program to perform music… live! Yes, Ableton Live has long offered intriguing possibilities for creative musicians and performers. Let’s find out how far it’s come and see where it’s headed. Here’s a brief mention of the software’s features before going all-in in our Ableton Live 9 Suite review. 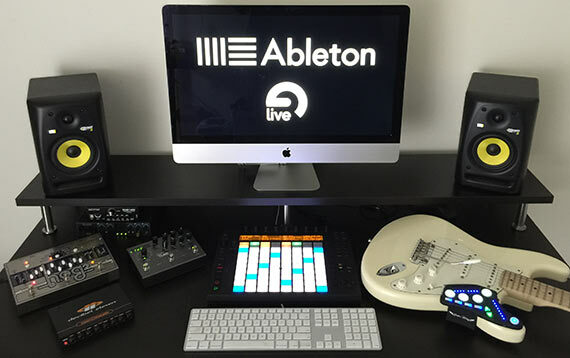 Visit Ableton for Live feature comparisons and more info about Ableton Live 9 Suite & Push. First and foremost, Ableton Live is a digital audio workstation (DAW) and should be assessed as such. Part of what sets Ableton Live apart from the crowded market of software sequencers and recording programs is its simple and innovative interface that uses 2 intuitive workflow modes, Session view & Arrangement view, that are quickly alternated with a press of your computer keyboard’s Tab key. Arrangement view offers a traditional left-to-right timeline format, letting you arm tracks for recording and fill the Arrangement view with segments of recorded audio. These pieces of audio are called “clips” and are the building blocks of songs in Ableton Live. You can set loop points to keep recording with each pass for the perfect take and also punch in & out for edits. Clicking on a clip shows it in the Clip View at the bottom of the screen, revealing parameters for editing the clip including Gain adjustment, detuning & transposing, and even reversing the clip among other things. Here you can also apply envelopes to the clip like, say, using a carefully placed Volume envelope to reduce a single volume peak in an otherwise perfect take. Right-clicking a selected “clip” of audio reveals additional options including Split and Consolidate functions for splitting a clip into multiple clips or merging multiple clips into one, respectively. Guitar players typically come up with riffs and chord progressions and piece together what fits to make a song. This style of spontaneous song creation corresponds perfectly to working with clips in Ableton Live’s Session view. Guitar riffs are essentially little loops of melodic progressions just as audio clips in Live are segments of music. The Session view lets you load or record audio and midi clips into a vertical grid of tracks and trigger the clips individually or in horizontal rows called Scenes. Imagine having several columns of audio clips for Guitar, Bass, & Drums, respectively. Each clip may represent a guitar or bass riff you’ve recorded and/or MIDI drum loop patterns or audio drum loops. Ableton Live’s Session view allows you to easily experiment with combining your riffs and drum loops in various combinations to create verse, bridge, and chorus sections for your songs. This facilitates the possibility of creating completely spontaneous live jams of loops while being able to simultaneously record and layer new clips in realtime. You can record the results to Arrangement view to create the foundation of a song and continue editing and recording new parts to your song from there. The tracks of Session view correspond to Arrangement view, so you’ll see your recorded clips from Session view when tabbing over to Arrangement view. While other DAWs on the market can seem cumbersome by comparison, Ableton Live’s 2-view interface and easily collapsable and expandable feature sections make it very intuitive to use. If you find the complicated interfaces of other DAWs to be illogical and unreasonable, the simplicity and elegance of Ableton Live – and it’s gentle learning curve – will definitely be a strong selling point for you. Due to the super low latency of modern recording interfaces, some musicians are beginning to discover the potential of running their instrument into Ableton’s effects and mixing it with Live’s audio output or even running the signal back into an amp. Ableton Live gives you the opportunity to play your guitar through Live’s own unique effects and an every expanding world of VST plug-ins in a live performance situation, a dream come true for many guitarists seeking bold new sounds. VST or Audio Unit plugins may sometimes add noticeable latency, but you can still find solid results from some less CPU hungry plugin effects. Live’s internal effects typically yield the best results as they’re integrated within the software itself. Even complex chains of effects in Ableton Live’s “Racks” can be used in realtime with minimal latency. 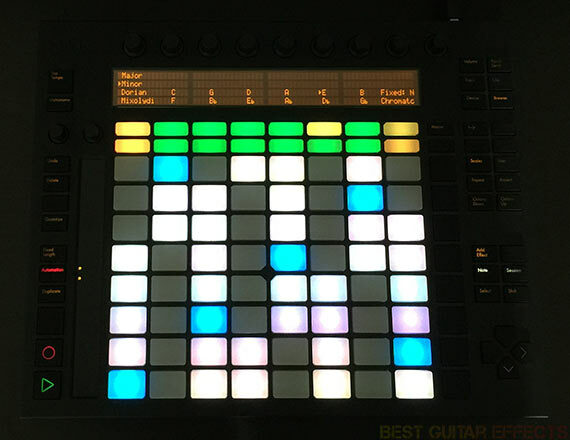 in Ableton Live to process your guitar signal in real-time. Ableton Live 9 Suite also comes loaded with a ton of great audio effects, including Grain Delay, Filter Delay, Beat Repeat, Phaser, and Flanger among others. Effects like Beat Repeat and Grain Delay offer sounds that go beyond what you’ll find in most traditional stompbox effects pedals and offer some serious creative possibilities for guitarists. This gives creative guitarists a big incentive for plugging their guitar into Ableton Live and exploring the effects available. 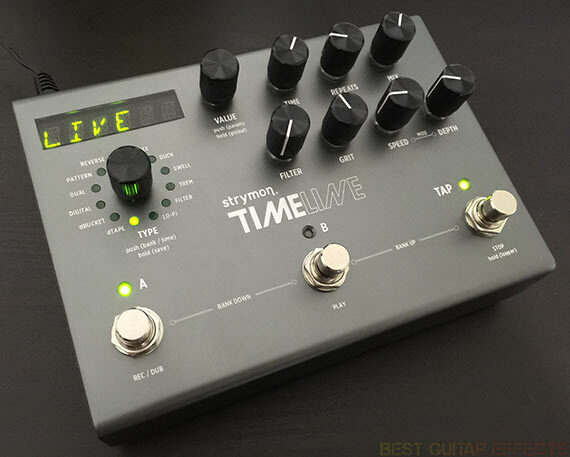 Here’s a deeper review of a few of Live’s more guitar-focused effects. The Amp & Cabinet effects (created by Softube for Ableton) are exclusive to Live 9 Suite and aim to emulate the nuances of 7 classic amps and various speaker cabinets. Just like a real guitar amplifier and speaker cabinet, Amp & Cabinet must be used in series to achieve the intended results. Amp & Cabinet can sound pretty great when used to process synthesizers and other instruments. For guitar, however, results may vary. The “Blues” model is probably the best of the bunch on its own, capturing a solid clean sound and a decent mild crunch tone, but the heavier models, particularly Lead & Heavy, didn’t provide satisfying enough distortion for my tastes. I experimented with Live’s great Overdrive and Saturator effects in front of Amp & Cabinet and once again found some distortion sounds that worked great with various synth tones. For playing and recording guitar with Live’s Amp & Cabinet effects, I found the most usable results when using pedals to saturate and liven up my sound before it hit my audio interface. I ran the Empress Effects Heavy into the Clean Amp model with a 4×12 Cabinet setting and found the heavy tones I was looking for. 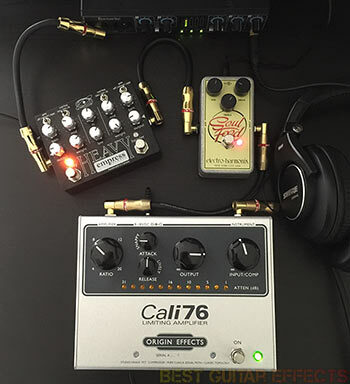 Also, the high-end Origin Effects Cali76 compressor was a nice touch in front of the Blues model for even more bite and a professional sheen on the front-end. And I used the Electro Harmonix Soul Food in front of the Rock Amp model to get a solid crunch sound that was adequate for recording. Adding some guitar pedals to the mix certainly helps, but I wish Amp & Cabinet stood on their own more easily. You may also consider using either a 3rd party guitar amp plugin or miking an actual cab. I’ve personally had positive experience with the Rivera RockCrusher Recording for recording real tube amp head tones directly into Ableton Live. The release of Amp & Cabinet is a sign that Ableton are taking notice of guitar players which may perhaps yield more comprehensive guitarist-focused features if users demand it. There have been many live looping musicians switching from stompbox looping pedals to Ableton Live in recent years. Ableton took notice of this and finally added a full-fledged Looper audio effect with the release of Live 8 that looping pedal fans will appreciate. Looper’s single multi-function button can be assigned to a MIDI footswitch for easy access to Record, Overdub, Play, and Stop functions. Pushing the button once initiates recording. Each additional push alternates between overdubbing and playback. A quick double-tap of the button stops playback. Holding it down for a couple seconds from there clears the loops. You can also program a MIDI controller to take control of Looper’s individual functions. 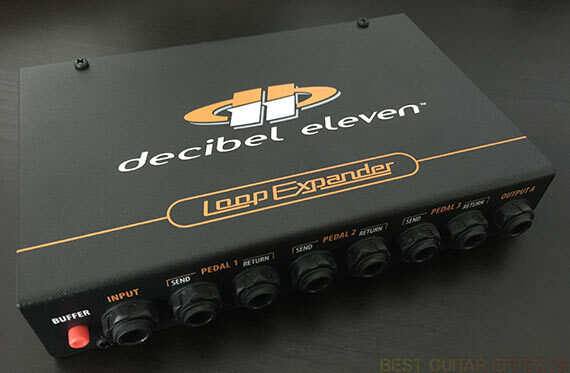 A MIDI compatible foot-switch or pedal switcher/router like the Free The Tone ARC-53M or Decibel Eleven Switch Dr. would be good candidates here for control of Looper’s Record, Overdub, Play, and Stop functions. There are also familiar Reverse and Speed options which you may also control via MIDI for yet more creative live looping possibilities. Try using a MIDI controller knob or touchstrip (or maybe an expression pedal via the Switch Dr.!) to mangle the speed of your loops at the end of a performance. Max For Live comes with Ableton Live 9 Suite and offers a huge library of user created Audio and MIDI Devices that seamlessly integrate with other effects in your Ableton Live workflow. Users wishing for certain tools have used Max For Live to create their own and share them with the world. There are many Devices that can improve your workflow and add even more features to Live. One useful Max For Live Device I’ve found is DialToProgramChange which lets you use MIDI CC messages to select MIDI Program Changes, useful for selecting presets on your MIDI-compatible effects pedals with track automation or with a MIDI controller knob. There’s a lot available, far too much to cover in this review. Find out more about Max For Live here. There is one area of Ableton Live that offers unparalleled performance potential yet remains untapped by most guitarists. Ableton Live can take complete control of your pedals and effects, freeing you from having to stand over your pedalboard staring down at your feet when you could be giving your audience the show of their life. This is ideal for performers who have a preset order of effects changes to be made during songs. It all comes down to MIDI (Musical Instrument Digital Interface), the protocol standardized in the early 80’s that allows communication between musical instruments. 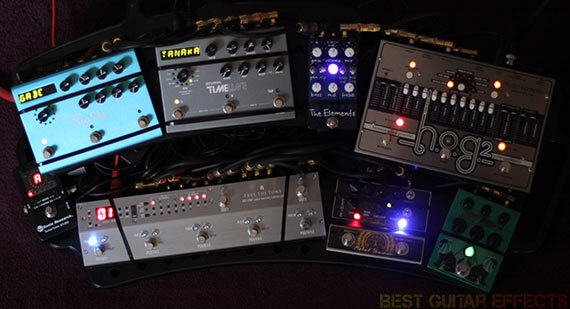 In recent years pioneering effects pedal builders such as Strymon and Eventide have been making MIDI implementation a standard feature on their flagship pedals. While outputting MIDI information from Ableton Live is typically used for sending MIDI data to hardware synthesizers, samplers, and drum machines, information can also be sent to MIDI-compatible pedals and effects switchers/routers to control various parameters and activate & bypass your pedals. This is a big deal. Add a MIDI-compatible pedal switcher to your setup, and you could theoretically control your entire rig from Ableton. Guitar amplifiers that support MIDI channel switching are game here, too. Imagine just being able to play your guitar and never having to step on a single foot-switch, not even to tune! Remember that time when you were on the opposite side of the stage and remembered you needed to step on your overdrive pedal for a solo? What about accidentally stepping on another pedal on a cramped pedalboard and hitting your audience with a wall of noise? With Ableton Live you can remedy all these problems and improve your live performances in the process. This is the pedalboard I used for my first show where my effects were completely controlled by Ableton Live. Since I was playing with a band that used some backing tracks, I loaded the song accompaniments into Ableton Live and laid them out in Arrangement view in the order of our setlist. I created a MIDI track for each pedal I was going to control via MIDI and selected a MIDI channel on each pedal and corresponding track. I then programmed MIDI automation via clip envelopes on separate MIDI clips to control the effects pedals. I used MIDI program change messages and continuous controller messages to create points where pedals would automatically engage and disengage. I also programmed some automation of effects parameters, often controlling multiple parameters on 2 different pedals at once, including some intricate automation that would be impossible to pull off otherwise, even with a foot-controlled expression pedal. The single best thing for me was programming signal mutes during all the moments where I wouldn’t be playing something. This ensured complete silence and also allowed me to tune during any absence of guitar and in between songs. All I had to focus on during that first show was playing my guitar and discovering new opportunities to interact with the band and audience that I wouldn’t have found otherwise. Playing my first show with Ableton Live controlling all of my effects pedals was one of the most liberating experiences I’ve ever had as a guitarist. And that was just the beginning. Below is a screenshot of my first Live set where Live controlled all of my effects changes. (Open in a separate tab or zoom for full-res.) Notice the tempo automation on the Master channel. One MIDI track called “ARC-53M” controlled all my non-MIDI effects. 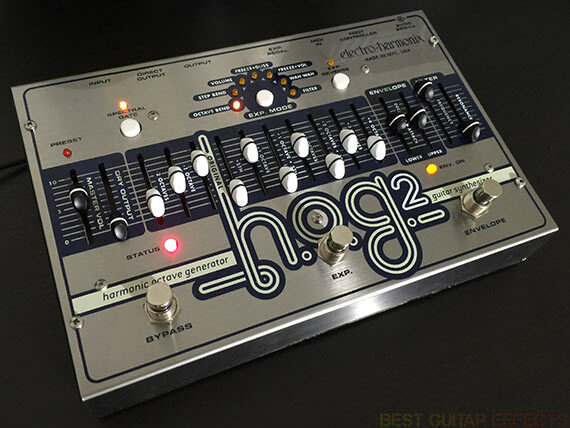 A separate track called “TimeLine” and “HOG 2” controlled those 2 pedals, respectively. Here are a few of the products I’ve used with Ableton Live and some info about their functions with MIDI. While it’s great to have a piece of software powerful enough to use in a live performance situation, no one wants to be hanging over a laptop looking like you’re checking your email onstage. The first time I used Ableton Live live with effects automation and backing tracks, I just hit the spacebar and let the automation play, crossing my fingers that everything would go smoothly (luckily, it did!). But part of what using Ableton Live live is all about is finding interesting new ways to control the software and create music live without being restricted by tending to your computer on stage. Here are a couple of the more interesting MIDI controllers that can take your Ableton Live performances and production to the next level. 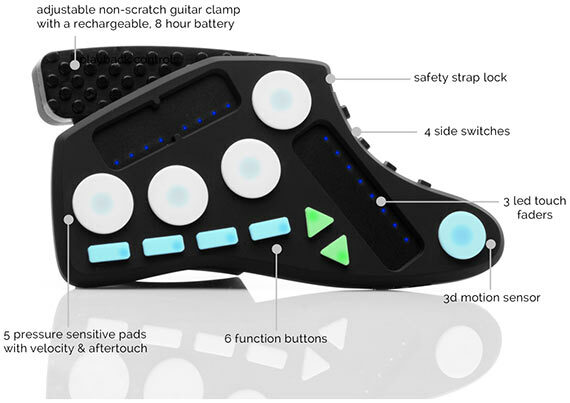 The Livid Instruments Guitar Wing is “a 3D wireless controller for guitar and bass” that lets you take control over Ableton Live and MIDI-compatible hardware in ways unavailable to most guitarists until now. 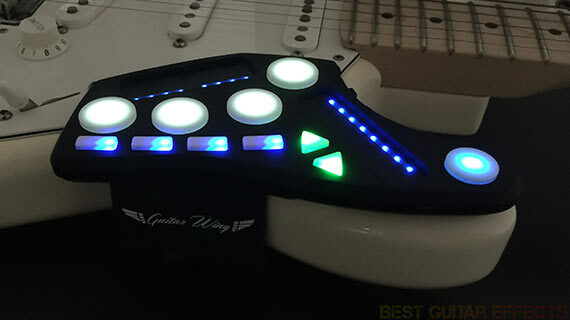 The Guitar Wing features 5 pressure/velocity sensitive pads, 4 function buttons, 2 direction buttons, 4 side buttons, 1 touch fader, 1 dual touch fader, and a motion controlled accelerometer. 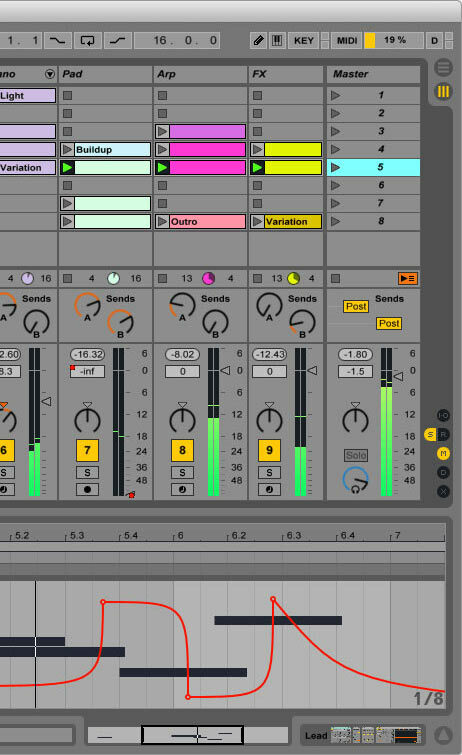 All of these functions can be mapped to control various parameters within Ableton Live. Need transport controls for easier home recording workflow? Want to launch some clips from your guitar? How about controlling a complete suite of effects to radically transform your live shows – all from a controller that’s securely mounted to your guitar? This creative little controller does it all. I’ve found it especially useful to map Ableton Live’s transport controls (Record, Play, Stop) to the Guitar Wing for control of the software when recording. So convenient! mappable to control nearly every aspect of Ableton Live. The Guitar Wing also comes with WingFX a suite of effects that can be used as a standalone application or as a plug-in within a DAW such as Ableton Live. This gives you a convenient introduction to using the Guitar Wing to control effects like Pitch Shifting, Distortion, Reverb, Delay, Wah, Bit Crushing, Filtering, Auto Chopping, and more. These effects are quickly accessed at the press of a button, a tap of a pad, or a swipe of your finger. Guitar Wing being used to control Ableton Live and trigger effects. Ableton’s Push “instrument” is a unique MIDI controller designed to let you create a song entirely from scratch. It lets you quickly program drum beats, create song structures, and add complete instrumentation with Live’s full suite of instruments and effects. Ableton Live 9 Suite gives access to plenty of synth instruments and drum sounds to begin creating music with Push right out of the box. Once you learn the ins-and-outs of Push, you can create your own templates of sounds for a creative foundation for making full tracks or just jamming. Ableton Push is a great source of inspiration for guitarists wanting to expand their horizons into the realm of electronic music creation. One aspect of Push that will provide familiarity to guitarists who want to try their hand at playing this innovative “instrument” is being able to perform and program melodies using familiar scale shapes. You can select from a full range of scales and key signatures and input notes and chords via Push’s pressure sensitive (and beautifully illuminated) grid of 64 touch pads. Chromatic mode gives guitarists a familiar visual grid of scale patterns tuned in 4ths, similar to how they appear on a fretboard, or you can “fold” away notes that are not in the scale you’re using to achieve an extended range of notes that are always in harmony with the scale you’re using. I personally like playing in Chromatic mode for easier visualization of scale shapes and for the flexibility of having access to notes not in the particular scale I’m currently using. Below is an example of an E Minor scale with the root notes lit up in blue, other notes of the scale in white, and notes not in the scale greyed out, but still playable. Ableton Push, as advertised, really excels at letting you create song ideas quickly. The wide range of sounds available in Ableton Live 9 Suite combined with Push gives you plenty of options for creating tracks from a new perspective. Push also has a couple of foot-switch ports, the second of which can be used to add foot control of Push’s record button. You could also assign a foot-switch to control Looper functions for easier improvisation between Push and your guitar. and guitar to create some backing loops to jam over. Ableton Live was originally created by electronic musicians for electronic musicians. 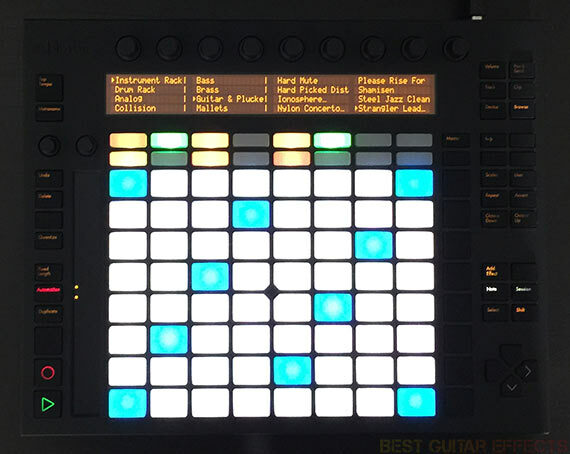 While musicians of all different backgrounds have found ways to adapt Ableton Live into their workflow, there are still a few areas that could be improved for guitarists and other live instrumentalists. It would be nice to see Ableton create a more extended suite of tools for guitarists, a revamped Amp & Cabinet suite of emulated amps, cabinets, and stompbox-style effects. There are 3rd-party plugins that offer deep tools for this, but it would be great to see Ableton take this to the next level with even more integrated, latency-free Live Effects for guitarists. When using MIDI clips containing automation to control your instruments and effects, you’ll use MIDI CC (Continuous Controller) messages to automate the parameters of your effects. However, external hardware and pedal effects most often require MIDI Program Change messages to switch presets. Currently, Live’s MIDI clips can only send one Program Change per clip. This means if you’re triggering a scene containing Audio Clips and one or more MIDI Clip for effect automation, you’ll only be able to select one effect preset per MIDI Track unless you use a column containing MIDI Clips of precise length with Follow Actions to change presets in sequence at specific moments of the Audio Clip’s duration. This can become quite cumbersome and unwieldy. Perhaps Live’s MIDI Clips could allow sending multiple Program Changes using automation similar to automating CC messages. This would easily facilitate the use of several different presets on a piece of hardware during a song without the need for a long column of MIDI Clips of precise length using Follow Actions to change presets at precise moments. Also, what if Audio Clips could somehow use MIDI? I find having completely independent Audio and MIDI clips to be a metaphor for the separation of the worlds of analog and digital music. It would be interesting if Ableton could create a way to add MIDI automation directly to Audio clips. Perhaps an Audio track could also be assigned a MIDI channel and a clip could send MIDI Program Changes and CC messages via automation within the clip. Imagine instead of having a web of Audio Clips, MIDI Clips, and Follow Actions, you could trigger a single Audio Clip containing all the automation for your external effects. Speaking of Follow Actions, I’ve always thought it would be nice to “Fold” Scenes in Session View, hiding Scenes with Clips containing Follow Actions that won’t be directly triggered when performing in Session View. This would be very helpful when using a performance MIDI controller to clean up and condense your palette of clips for triggering. While Live has sparked many musical breakthroughs for countless musicians and performers, myself included, I still find some of my “Aha!” moments cut short by the segregation of MIDI and Audio. Often workarounds can be found, and many users have created Max For Live Devices that can enhance workflow. For Ableton Live to grow and facilitate the next step of musical evolution, I’d love to see Ableton Live 10 offer new ways to unite analog and digital musicians, performers, and producers, taking a bold leap forward out of its comfort zone to revolutionize music again in the way it did when the software first launched. But with all that being said… nothing else comes close to what Ableton Live has achieved so far. D.V.S*, who’s been forging ahead with Ableton Live. Let’s the see the final result. Ableton Live 9 Suite offers unprecedented power for guitarists to create music in the studio and on stage with revolutionary possibilities that remain untapped by many guitarists. As a DAW that offers one of most mild learning curves, Ableton Live is an excellent choice for the first time home recording hobbyist and creative performing musician. Ableton Live stands out among other recording software in that it is truly an instrument unto itself to be learned, mastered, and performed. Ableton Live allows you to build a track from nothing, remix a production live, DJ, control your guitar pedals and effects “foot-free”, and so much more, solidifying its reputation as a leader among digital audio workstations. While Ableton could still offer more that specifically caters to guitar players and traditionally non-electronic musicians, it still stands out as what is arguably the best DAW for effects using guitarists and performing musicians. 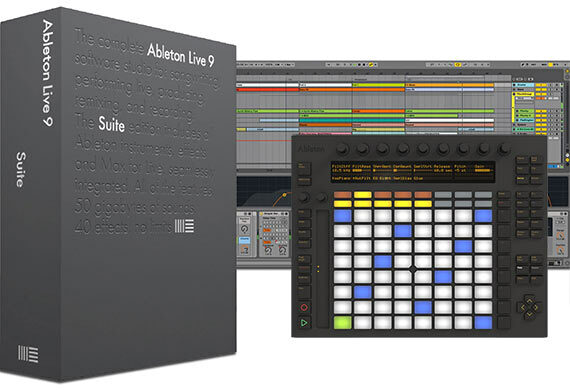 That concludes our Ableton Live 9 Suite & Push review. Thanks for reading. Want to buy Ableton Live 9? Ableton is great but a little expensive…and now Im looking for the easiest way to get into making beats. I’m thinking hip hop or rap because I already have a few ideas in my head. Im not experienced though… What do you recommend at a lower price point that will get me going? Any feedback will be apreciated… I have found this software and I wanna know if it is good to produce rap music beats. Great review. I enjoy live and push, but… I have timing issues and I have a ultra fast PC in a Rack unit. I really can create very different stuff with it… but when I deal with hardware sequencers I really fell more connected with the vibe. I think even the few latency just ruins the vibe in a live loop situation, even just with midi looping. Sometimes the external gear freezes and I hate it. Push itself is a beautiful box, but mine loose some screws, the holding thread get cracked. But its good to record everynthing easily when you hit it. Maybe Social Entropy Engine could solve my problem, after I can afford it.